In today’s economy, well-off people live in big cities, while everyone else gets pushed out. Bringing new Amazon offices to Virginia and New York could hasten the process. On the long list of things that New York City desperately needs—money for the subway, for affordable housing, for schools and public hospitals and universal pre-K—more high-paying, high-skilled jobs is not at the top of the list. It could be argued, in fact, that many of New York’s ills are caused by the explosion of high-paying jobs in a city where the construction of affordable housing and transit improvements has not kept up pace. Yet New York and hundreds of other cities spent the past year trying to convince Amazon to bring 50,000 jobs to the city, a process that was rewarded on Tuesday when Amazon formally announced that it would set up new offices in Queens and in the Crystal City area of Arlington, Virginia. That New York and Arlington were so heavily courting Amazon is not surprising: It is a trillion-dollar public company, and it is constantly creating new divisions and products that change the way we live and work. The company has vowed to bring at least 25,000 jobs in each city, as well as $5 billion in investment, and tax revenue and redevelopment plans that will create more jobs. “This is a giant step on our path to building an economy in New York City that leaves no one behind,” New York’s Mayor Bill De Blasio said in a statement. But Amazon is also bringing thousands of high-paying workers to two markets where the competition to find affordable housing is already fierce, and it is introducing yet more bodies into cities where transit is crumbling, but people are forced to live further and further from the city center due to rising housing prices. In San Francisco, the average rent for a one-bedroom is now $3,300, up 22 percent from 2011. Low-income people and people of color are being pushed farther and farther away from the city center—tales of hours-long commutes one-way are not uncommon—and often work in contract jobs with little job security and no benefits. A year ago, I visited Merced, CA, an inland city two and a half hours from San Francisco, and encountered people who had left the Bay Area, even though they had to take lower-paying jobs in Merced, because they could no longer afford to live in the city. “High-skill workers are still moving to places that offer them high incomes, but now, low-skill workers are moving away from places where average wages are high,” I wrote, at the time. New York’s housing market is already tight. The share of housing units available to low-income households fell 12.9 percent between 2006 and 2016, according to a 2017 report from NYU’s Furman Center. The city said in September that it has lost more than 400,000 affordable housing units since 2005. Meanwhile, the population of the DC metro area has increased seven percent since 2010, but the number of housing units has grown only three percent, according to the Urban Institute. 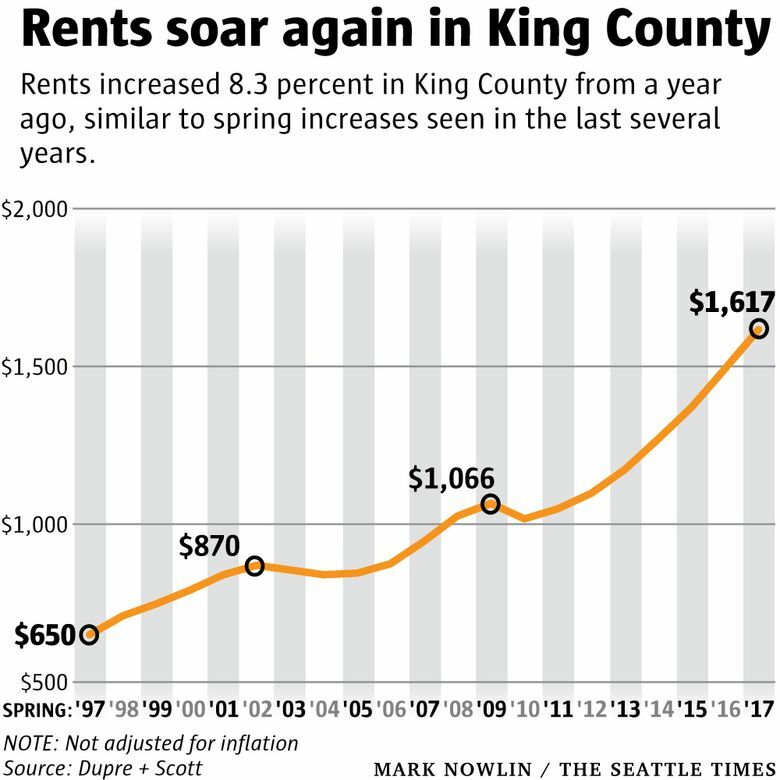 There are signs that this is changing the dynamics of who lives in the region: the number of renters with incomes between $100,000 and $149,000 has grown 58 percent between 2000 and 2018, according to the study, far outpacing growth in renters with incomes of $50,000 to $74,999, which grew just eight percent. Of course, there is no guarantee that the presence of new tech jobs in New York and Arlington will create the same problems that tech job growth created in Seattle and San Francisco. “Things like a major relocation or HQ expansion should be a very positive thing—but it takes a lot of intentionality to make sure that’s the case,” said John Lettieri, the president of the Economic Innovation Group, which researches what makes cities and regions successful. Officials in New York and Arlington say that they have a plan for the influx of new residents. When New York mayor Bill De Blasio was asked by reporters at a press conference how he was going to make sure that New York didn’t follow other cities’ paths to unaffordability, he dismissed the question. Seattle and San Francisco “are totally different places than this,” he said. New York is planning to add hundreds of thousands of housing units over the next few decades, and the growing tax base from Amazon will afford it more money to invest in housing and transit, he said. Arlington County and the city of Alexandria promised an investment of $570 million in transportation projects to help accommodate the growth that Amazon would bring. The state of Virginia also said it would invest $195 million in infrastructure for the neighborhood. Arlington projected that around 2,000 affordable housing units would be created in the area in the next decade. But even if Arlington and New York are able to create some affordable housing, it takes years to build new housing units, and it’s unlikely that the cities will be able to create enough units for next year, when Amazon says it will begin hiring. It takes longer to get approval to build new housing units in cities like Washington and New York, and no part of the Amazon plans mention how the cities plan to speed up this process. There are, of course, other problems with Amazon’s HQ2 bid. There’s the time wasted by cities and state legislatures preparing extremely detailed pitches at Amazon’s request—which took more time than most economic development proposals, Sam Bailey, the vice president of economic development at the Metro Denver Economic Development Corporation, told me last week. There’s the unprecedented cache of confidential information cities gave to Amazon about development and infrastructure plans that it hasn’t given to anyone else, even the public. There’s the fact that Amazon may have known from the start that it would have to place its new offices in superstar cities like New York and Washington DC where highly educated people live. But the most striking thing to remember is that Amazon is big enough to change the fabric of the regions where it locates. And as it has in other places, it may make big winners out of some people, while making life more challenging for everyone else.